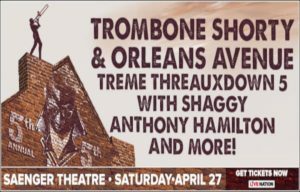 Trombone Shorty’s 5th Annual Treme Threauxdown at the historic Saenger Theatre in New Orleans will take place Saturday, April 27 during the opening weekend of the 2019 New Orleans Jazz & Heritage Festival. Trombone Shorty & Orleans Avenue will welcome another stellar line-up special guests including Grammy-winning reggae artist Shaggy and 2019 NBA All-Star Game halftime performer Anthony Hamilton. A 2011 GRAMMY Award nominee for his album Backatown (Verve), Troy “Trombone Shorty” Andrews’ virtuosity and high-energy live shows have drawn unanimous raves worldwide with Rolling Stone calling him a “must-see act.” He was named to Forbes’ “30 Under 30” Class of 2016 for Music along with Selena Gomez, The Weeknd and Jon Batiste. Andrews is passing down his musical knowledge and keeping the New Orleans brass band tradition alive through his own Trombone Shorty Foundation and Music Academy, and since 2014 has worked as a “Turnaround Artist’” with the Turnaround Arts Initiative, a program that helps low-performing schools improve through intensive arts programs.